"The time for talking is over - the world must act on the Green New Deal, right now. "Green Party Leader Caroline Lucas MEP helped formulate the Green New Deal, a concept being widely supported by Governments, yet not acted upon. It is simply unacceptable if world leaders are going to emerge from G20 with more pointless group photos and warm words, but no real action. "A failure to implement a Green New Deal soon, in this country, across Europe, and across the planet, will both increase the likelihood of the recession worsening and fail to tackle the looming threat of dangerous climate change. Time is running out. "The G20 must act boldly - we need a repeat of what Roosevelt did in the 30s, but on a worldwide scale, and with a deep-green-hue. The beauty of a 'Green New Deal' is how it makes such great economic sense: green jobs in renewable energy, energy efficiency, sustainable agriculture and public transport systems - an investment for the future in making our economy greener, cleaner and more efficient. "Globalisation has failed catastrophically and utterly. I will be going to London on April 2nd, when the G20 meets in session, to add to demands for co-ordinated action now for global justice, for a Green New Deal, for a massive re-regulation of the financial markets. "With the exception of Barack Obama, the G20 leaders are the very people who got us into this catastrophic economic and environmental mess that we are in, by handing power over to big business and big monied interests. It is time for the people to take that power back!" The G20 marches in London this weekend were peaceful and raised the profile of the need for action on jobs and the green economy. The Green Party supports peaceful action in this way - the messages that need to be addressed to world leaders are too important to be clouded by non-peaceful actions. Every existing town should make the transition to being an eco-town, not just a handful of new towns - which may be far less green than they at first appear. One of the Government's planned 'eco-towns' is on the outskirts of Norwich. The plans are generally quite good, mostly on a brownfield site - but the scheme as it stands is dependent upon building a massive new dual-carriageway road around the north side of Norwich, if it is to work. This is completely ridiculous - you cannot have a genuinely eco-town that is highly dependent upon a major road-building scheme. By definition, a true eco-town should be designed to maximise the use of public transport, cycling etc, as are the existing eco-towns in other countries that provided the original inspiration for Britain's 'eco-town' plans. At the start of April the Green Party campaign to win a seat in the European Parliament is going up a gear. Lead candidate Rupert Read is embarking on a whistle-stop tour of Hertfordshire and Bedfordshire, in order to listen to his prospective constituents and to offer the Green Party's distinctive solution to the credit crunch: the Green New Deal. "Europe needs change and if enough people in Eastern England get behind the Green Party, we can help make that change happen. The Green New Deal aims to create 5 million jobs across the continent, including a million here in Britain, and at least 100,000 in Eastern England. "The Green New Deal is a way to combat dangerous climate change and help end the recession at the same time. It would set the European economy on a sustainable path and place Europe at the forefront of the Green industrial revolution. For a greener economy and a cleaner politics, there is only one sensible option: Vote Green!" With long summer evenings coming, we have the opportunity to canvass [and leaflet] like we've never done before: and get a Green MEP elected here too, on June 4th. 'plays its role' by remaining silent). Green Party Councillors are asking Norwich City Council to oppose the Government's plans to merge the fire control services of Norfolk and other counties in East Anglia into a regional control centre which would receive emergency calls and manage the fire service response. The councillors say the plan, known as FireControl, lacks the confidence of firefighting professionals who are worried that regional centres would lack sufficent call handling capacity and local knowledge. Norwich Green Party councillor, Adrian Holmes is submitting a motion to the City Council's next meeting, on Tuesday 31st March, urging the council to voice opposition and press the government to rethink its plan. "Norfolk has one of the best fire services in the country and this plan will do nothing to improve it and may even damage its capacity to deal with incidents. Responses to incidents in Norfolk are best managed from a Norfolk control centre with local knowledge." "'I am worried that in East Anglia the fire services' capacity to cope during a major disaster, like the one which happened at Buncefield oil storage depot in Hertfordshire, may be diminished if the proposed new regional fire control system is pushed through, as there are grave doubts about the proposed system's call handling capacity. Regional fire control centres only make sense in the context of a regional fire service and regional government - ideas which the government has abandoned. It's also clear that the funds could be better spent. Management consultants have swallowed up over £40 million, underused regional control centres are costing many millions of pounds in rent and a report by the Institute of Public Finance (IPP) reveals that the overall project costs are exceeding £1.4 billion. This at a time when the region's fire services still need money to be able to tackle major flooding incidents or outdoor fires. The people who risk their lives, the firefighters, are saying the funds would be better spent on frontline." 1. That the Government has acknowledged the excellent work of Norfolk's Fire Control Service by placing it in the top rank of services throughout the country. 1. That the proposed amalgamation would reduce the effectiveness of Norfolk's Fire Control Service by taking away local knowledge and introducing inferior equipment. 2. That the Government is misguided in trying to raise the standards of other fire services by reducing the effectiveness of Norfolk's fire service. 3. To write to the trade unions of Norfolk's firefighters to express support for their stand against the proposed amalgamation. 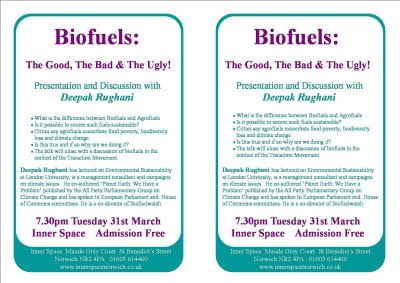 I'm looking forward to attending my good friend Deepak Rughani's presentation on Biofuels next week. Deepak is a powerful and knowledgeable speaker and his events are not to be missed. Hopefully I'll see plenty of familiar faces there! Ever thought of becoming a local councillor? Perhaps you’re already involved in local affairs and want to take the next step? Or perhaps you just like the idea of doing something worthwhile and rewarding to help your community. Eastern Region Green Party has conducted a survey over recent months of local post offices in the region. Sub Postmasters and Postmistresses were contacted about the service they currently provide, what they could provide in the future and how important they considered Post Offices are to the local community (1). 98% felt it was important that their particular Post Office remained open, citing 11 different reasons as to why they felt this way. Many replied that they could provide a public and social service and that they were the eyes and ears of the community. They helped to combat fraud and would know if someone was having health or domestic difficulties and therefore could alert neighbours. 81% agreed strongly that the local sub Post Office provide a hub for the local community and 91% disagreed that the Main Post Offices are more convenient. 71% disagreed that Main Post Offices were more efficient at providing services than a sub Post Office. 69% disagreed that most people can get to a main Post Office these days. Many added that the Post Office helped to support the vunerable in their community, e.g., the elderly, as there were no other amenities available to them compounded by poor local transport. Many replies pointed out that Post Offices are a good source of networking which can encourage use of local trades and supply customers with locally produced provisions. 63% felt it was vital to their local community to encourage people to shop locally with 85% agreeing that local sub Post Offices were important because they avoided the need for people to use their cars. 55% of sub Post Offices surveyed said that services such as bill payments were very important and wanted to offer services which have been taken away, for example, 67% wanted to be able to offer TV licence renewals (previously a service they offered which has been taken away from them). Whilst is was recognised that accessing services via the internet and telephone was available, 92% agreed strongly that for those without access to computers, face-to-face help that the Post Office can provide should be available. 62% disagreed that the internet was better at providing most of the services you can get from the local sub Post Office. Worryingly, the results revealed that 48% of the sub Post Offices surveyed are already between 3 - 10 miles away from each other. "Our survey results reinforce the strong feeling in local communities that Post Offices are a vital part of the social fabric of our society. Despite this, numbers are reducing year on year thanks in part to the deliberate actions of Government taking away services from them. There clearly needs to be a stable economic environment for Post Offices to operate in, but the Government is failing to take full account of the hidden financial and social benefits of a thriving Post Office network in terms of a host of gains including social cohesion, health, combating fraud and crime and building sustainable communities. The Green Party is fully committed to protecting our Post Office network and will continue to oppose further cuts. Closures must cease immediately. Furthermore, we believe that Post Offices should be able to provide more services than they do at present. Our survey indicates that Sub-Postmasters and Sub-Postmistresses would like to be able to offer TV licensing and banking facilities - to help them become once again a true hub of the community. The Green Party backs this aspiration - we would invest in the Post Office network, not run it down." First they sold us agrofuels: palm oil from felled and drained tropical peat forest continues to be mixed into UK diesel, leaving an 800-year carbon debt behind. Now industrial biomass and agrochar [its advocates call it 'biochar', because that sounds nicer than what it really is] are coming of age. Widely touted as the most promising geo-engineering 'solution', agrochar - industrialised agricultural turning of forests into charcoal which is then 'planted' in the soil - actually threatens to commit us to worsening dangerous climate change, bringing chaos to planetary life support systems including the rainfall cycle upon which global crop production depends. However, this is an extraordinary week for those concerned that 'false solutions' are exacerbating manmade climate change. On Tuesday, George Monbiot wrote lucidly in GUARDIAN about the hype and misinformation surrounding agrochar, and just a day earlier I spoke at Green Party Spring Conference in Blackpool and helped to bring about an almost unanimous vote against climate geo-engineering 'solutions' which further imperil ecosystems, biodiversity and human communities. The motion that was passed particularly emphasised the risks of agrochar. The Green Party has led the way on so many other things, which were at first seen as 'radical' but that are not common-sense: so we hope it will be on this issue, too. Last November, my friend and fellow Party-member Dee Rughani gave presentations on agrochar at NGO conferences in Berlin and Brussels. Many of the big environmental NGOs were represented yet it was hard to find a single person who was familiar with agrochar. The agrochar lobby had been working silently behind the scenes, managing to keep the issue outside of NGO discussions. So successful has this approach been that less than a month later at the UN climate conference in Poznan, the 'International Biochar Initiative', uncontested, succeeded in lobbying the Secretariat of the UN Convention to Combat Desertification (UNCCD) to get agrochar included in the draft agenda for discussions at the Copenhagen climate conference this year. Since Poznan, other regulating bodies are giving consideration to a proposal by carbon trading company, Carbon Gold, for agrochar to receive double carbon credits under the Clean Development Mechanism. Expect some fairytale spin on this one. Industry lobbyists have found the most profitable 'climate solution' yet! But their dirty secret is out; let's mobilise now to nip this in the bud, and not repeat the same mistake that the world made in allowing agrofuels to take off. I welcome reports that management at Archant has reduced the number of jobs it is intending to cut in Norfolk from 54 to 34. But I hope that Archant executives will try to further reduce this, to protect the quality of local newspapers. 'It is good news that Archant executives have revised their plans for redundancies in Norfolk, but 34 job losses would still be a massive cutback of editorial staff. It would raise serious doubts about the capacity of local papers to provide a quality news service. The recession is no doubt affecting advertising revenues but the company has recently anounced £22m profits. I urge Archant to continue talking with unions and to look for every opportunity to save further jobs. Green Party Councillors in Eastern Region are backing a CPRE report (1) released earlier today which shows that the majority of regional transport funding is going on roads, and will be for years to come, and that road traffic levels have risen sharply over the last 2 decades. Although it is not possible to separate out entirely the different types of transport funded in each region, CPRE have estimated the Eastern Region proportion spent on roads at 60%. In the period 1993 to 2007, traffic (measured as million vehicle kilometers) rose by 29% over the six counties of Eastern Region, the equal second highest rise in England and with only the East Midlands being higher. Figures from the Government (DEFRA) reveal that increasing greenhouse gas emissions from transport are cancelling out reductions in other sectors. Ministers claim that the UK can meet ambitious targets for reducing emissions yet since Labour came to power in 1997, UK carbon dioxide emissions have barely changed. "The CPRE are absolutely right to highlight the fact that regional transport funding amounts to "road building as usual". Policy has not changed and Labour is throwing loads of money at outdated road-building schemes that are not giving people transport choices but are damaging the planet. That's why we in the Green Party have consistently called for a 'Green New Deal', investing to improve public transport - and cutting destructive road schemes." "It is incomprehensible that Eastern Regional Assembly members are endorsing plans to carry on spending on road schemes when they have been advised by the Stern Report that we must invest in cutting CO2 emissions, and by leading scientists that preparations should be under way to adapt our economy to diminishing petrol supplies as the oil runs out." "Behind the green rhetoric of the authorities lies the truth - that it is business as usual - bigger airports and more roads, both of which are sucking taxpayers money away from sustainable development and at the same time leading to increased greenhouse gas emissions. In Essex, the latest price tag for a stretch of the A120 between Braintree and the A12 is approaching half a £ billion. Instead of looking at ways to make the existing road safer and relieve local villages, as the Greens have proposed, the regional planners, with the support of the other parties, want another gold plated section of Trans European Highway through open countryside. Meanwhile, long standing and widely supported proposals for improving the railways in mid-Essex sit on the shelf through lack of funding." AGE OF STUPID Director calls for Green government! This, with the climate crisis underlying other more apparent crises (such as the ongoing economic meltdown), is indeed an epochal moment in human history; it calls precisely for a sudden mass political switch to the Green Party, much as in earlier generations the Labour Party (before it became corrupted by New Labour etc.) sprang onto the Parliamentary scene from almost nowhere, and ended up giving us good things like the NHS. Rupert said: "I am looking forward a great deal to hearing about the experiences of Manningtree people at this time of economic downturn and wider uncertainty." Rupert will be in Manningtree from 9.20 to 12.00 on Thursday 19th and would be happy for anyone to engage him in conversation on political issues. Rupert's time in Manningtree starts at 9.20 at the Railway station where he and a group of supporters are happy to have photos and questions. I visited 'Graham Hughes Organics' at the Rookery Farm Industrial Estate (in Besthorpe) in the morning. This is a local family business run by organic pioneer Graham Hughes who has been growing and selling organic produce for over 20 years. It was great to meet Graham Hughes. Graham and his family have been leading the way with organic produce for more than two decades. Liftshare has been running now for over 10 years and is an effective means of finding others who are going to the same destination as you, for example, to work in the morning. Liftshare makes travelling a more social experience, helps to make a real environmental difference, and helps people split travel costs, which makes great sense during these testing economical times. Probably for that reason, Liftshare are flourishing. The Green Party is extremely concerned at the 3-year jail sentence that has just been handed down to Muntadar Al-Zaidi, for throwing his shoes at Former-U.S.-President George Bush. "Mr al-Zaidi's action did not physically harm anyone or cause any damage  only embarrassment to President Bush and the Iraqi Prime Minister, Nouri al-Maliki. Causing embarrassment should not be a crime. To send him to jail for three years over this protest is wholly disproportionate, and unbefitting of Iraq's new democracy," said Mr Tatchell. Norwich Green councillor Rupert Read, the Green Party's lead candidate for the Eastern Region in the June 2009 European Parliament elections, who has posted a pair of his old shoes to Gordon Brown and George Bush [http://tinyurl.com/82tq8n ], added, "Is this why 'the allies' invaded Iraq? So that a journalist could be thrown into prison for three years for a brief and harmless bit of free speech?" Jonathon Porritt endorses Green Party for the Euro-elections! dissonance" over the ecological crisis. rational decisions despite being able to clearly see the evidence. the Green Party and had been a member continuously since its founding. Green or not at all." when confronted with increasing evidence of runaway climate change. gave a ringing endorsement to the Green Euro-candidates. Previous issues can be accessed via the links on the left hand side of the blog! March 16 (Bloomberg) -- Britain's spending on public transportation and home insulation falls short of a "Green New Deal" needed to forge environmentally friendly growth, a committee of lawmakers said. A 535-million-pound ($750 million) "green stimulus" announced by Chancellor of the Exchequer Alistair Darling in November includes only 100 million pounds of new funds, the Environmental Audit Committee said in a report today critical of the plan. Most of the funds are merely accelerated spending on railways and energy efficiency already pledged in future budgets. "Taking money out of a budget two years down the road and bringing it forward to this year doesn't really count as a 'green new deal' at all," said committee Chairman Tim Yeo, in an interview. "That's very disappointing." In the U.S., President Barack Obama has pledged to spend $150 billion over 10 years to combat climate change and create "green" jobs. Alluding to the New Deal spending program to bring that nation out of the Great Depression in the 1930s, Yeo said Britain risks lagging behind in developing clean technologies and promoting growth that cuts reliance on emitting greenhouse gases blamed for global warming. "What Obama is doing is right, and it's what other countries will be doing as well," said Yeo, a member of the opposition Conservative Party. "That's right not just for short- term economic reasons, it's right for medium-term environmental reasons too, and Britain is going to look like it's lagging." The committee recommended the government adopt a target for the proportion of the U.K.'s economic output that should be spent on a "green" stimulus, suggesting 0.8 percent -- or about 11 billion pounds a year -- as a starting point. That stimulus would include other investments, such as subsidies for wind energy. The 16-person panel, which includes nine members of the ruling Labour Party, said the government's priority for a green stimulus should be to increase the scale and speed of programs to make existing buildings more energy-efficient. The Treasury responded by saying that the money included in November's report was "only a very small part" of the government's spending on environmental measures. "It would be wrong to mix up the 535 million pounds of green stimulus that was in the pre-budget report with the 50 billion pounds that we think is a conservative estimate of future investment we are putting into greening our economy," the Treasury said in its reply, which is included in the committee's report. The committee also criticized Darling's decision to retract a commitment to tax airlines on each flight rather than on each passenger and his withdrawal of another measure that would have increased taxes on higher-emitting vehicles that have already been purchased. "The use of tax to encourage greener choices has not been fully grasped, and that goes back the last three or four years," Yeo said. "It was even more important to do it this year, and they haven't done it." To contact the reporter on this story: Alex Morales in London at amorales2@bloomberg.net. Leading Green Party candidate for the European Elections, Cllr. Rupert Read, will be speaking at Southend Library on Thursday 26th March 2009 against plans to expand Southend airport. The Green Party is opposing expansion at Southend and other airports across the region because of the adverse impacts on the health and well-being of local communities, the impacts on the local environment and the additional climate-changing emissions from ever more aircraft in our skies. Cllr. Read will offer alternatives for a sustainable transport policy that will enable people to travel in a way that does not endanger the well-being of others or of the environment. "The Green Party would use money intended for airport expansion and channel this into modes of transportation that have a future, and that are truly sustainable over the long-term. Improving the railway infrastructure is the key Green transport policy and we would also invest more in the buses, walking and cycling schemes. I know from personal experience just how bad the impacts on people can be of living next to a major airport. My mother lives under the Heathrow flight-paths. It is hard to get any proper sleep there at all some nights. And there is no escape from it. Do we really want the same thing in the East of England? Do we want Southend Airport to become a major airport, in addition to all the others that the Government wants to expand in this region, including Stansted ? If I am elected as a Euro-MP for Eastern Region this June, I pledge to take all necessary steps to ensure that more planes do not blight our skies and our ear-drums through endless aviation expansion. In the meantime, I pledge to support the many people who live in this area who do NOT want a bigger, noisier Southend Airport." Cllr. Read will be joined by fellow speaker Kiti Theobald of Stop Airport Extension Now (1), and the event will commence at Southend Central Library on Victoria Avenue at 7.30 pm on Thursday 26 March. Everyone is welcome, whatever their views, and attendees will have the opportunity to ask the speakers questions. Europe needs change and we need your voice to make that change happen. Lets create 5 million jobs  Europe needs a Green New Deal! The Green New Deal will set the European economy on a sustainable path and place Europe at the forefront of the Green industrial revolution. Melting ice sheets could raise sea levels high enough to flood coastal areas around the globe by the end of the century, according to scientists gathering in Denmark for a three-day climate-change conference. The phenomenon could affect regions including Florida, the Netherlands, Bangladesh, and the Maldives, the British Guardian newspaper reports. The meeting, which brings 2,000 scientists to Copenhagen, is a run-up to December's international climate talks, where officials are set to draft a successor to the Kyoto treaty to limit carbon dioxide emissions. Experts will also update the work of the Intergovernmental Panel on Climate Change (IPCC), which released its findings on global warming two years ago. Some of that new information centers on the effects of glacier melts in Greenland and Antarctica. Not only are ice sheets in Greenland and Antarctica breaking up faster than scientists expected, but more of their melt water is flowing into oceans, which will raise sea levels by 3.3 feet (1 meter) by 2100. The IPCC previously estimated that sea levels would rise by 7.9 to 23.6 inches (20 to 60 centimeters) by then. A 1m sea level rise would result in large areas of low lying farmland in the UK - particularly in East Anglia, having to be lost to the sea. It would result in decisions having to be made about which communities to defend and which to evacuate. And it would put major towns and cities, including London, at increased risk of storm surge flooding. The total failure of Governments to act fast enough or radically enough is tragically illustrated today where a High Court decision has downplayed the need to look at climate change in respect of the Government decision to expand one of Londons Airports. The Government has granted consent to Stansted airport to expand by another 10 million passengers per year to 35mppa and also wants a second runway to expand it to as big as Heathrow is today - AND the Government wants a third runway at Heathrow and expansion at many other airports, all of which will increase UK CO2 emissions, totally at odds with the ever louder warnings from scientists. UK CO2 has barely changed since Labour came to power in 1997 and globally is rising fast. In the immediate aftermath of September 11 2001, a scandal broke in this country after Jo Moore, a new Labour special adviser to then secretary of state for transport Stephen Byers, sent an email to colleagues suggesting this was "a very good day to get out anything we want to bury." Her logic was that, when a mammoth news story breaks, the government has a window of opportunity through which to shunt into a black hole any news that would otherwise make the government more unpopular. This was classic new Labour news management - completely immoral, but effective. And we've seen similar behaviour over more recent scandals. The Treasury recently announced that it would insure £325 billion of toxic assets from Royal Bank of Scotland while pumping an extra £13 billion into the loss-making bank. After bailing out the banks in October with £500 billion of taxpayers' money, these developments must have worried the government. Would the public be prepared to keep funding the banks, while the banks were still acting as private businesses, were not lending in such a manner as to stabilise the economy, and, in some cases, were still charging high rates of interest? The government responded by concentrating the media's attention on the pension of Sir Fred Goodwin (above), the 50-year-old recently retired chairman of RBS who will receive about £700,000 per annum for the remainder of his lifetime. This story hogged the news limelight for the best part of a week, distracting everyone from the real news; the government had further burdened the British taxpayer - now to the extent of a year's GDP. It is time for the government to come clean and stop trying to hide the truth that, while it has authorised a taxpayer bailout of the banks, the way it has done it means that neither the taxpayer nor the government will be able to keep them in check. It is a very clever trick to hide this terrible truth behind fulminations from government ministers against the greed of the bankers, as though there were nothing wrong with the system. But it is now time for them to stop banging on about Goodwin and start the real task of reorganising our entire banking system in the public interest. I'm calling today for a further legal review of the Stansted airport decision announced today at the High Court, following a four day hearing held at the end of February, the first day of which I attended the court. The hearing considered a challenge by Stop Stansted Expansion (SSE) to the Government's decision to allow expansion to 35 million passengers per year. In handing down his judgement, Justice Sir Thane Forbes dismissed the three grounds for Appeal by SSE but also appeared to agree with them that their arguments were justified; ie that issues they appealed on were legitimate areas for consideration in planning terms, including noise impacts. SSE are now seeking a further Appeal as this judgement appears confusing. The judge appears to be saying that noise is a legitimate area for consideration but then goes on to throw out the Appeal which was based on just such concerns. If this expansion goes ahead, or worse still a new runway, noise blight over large areas of Essex, Hertfordshire, Suffolk and Cambridgeshire will dramatically worsen, which as far as I am concerned as the prospective Green Party MEP for this Region, is a totally unacceptable impact on people's health and wellbeing. A Norfolk cinema will be one of a few exclusive locations hosting the satelite linked launch of the climate crisis film 'Age of Stupid, at 6pm on Sunday 15 March. The film is being launched at a solar powered cinema tent in Leicester Square, London and beamed to 80 UK wide locations including the Eden Project in Cornwall, and Cinema City in Norwich. Norwich Green Party City Councillor, Rupert Read helped arrange the Norwich showing. Many local community leaders and politicians have been invited to the premier. The film stars Oscar nominated Pete Postlethwaite as a man living alone in the devastated world of 2055, looking at old footage from 2008 and asking 'why didn't we stop climate change when we had the chance?'. All profits from the venture will go the 'Not stupid' campaign which aims to turn 250 million viewers into activists focussed on the Copenahagen international climate negotiations in December 2009. ''Norfolk has scooped a lead over many prestigious locations to host The Age of Stupid. I urge everyone to see this film when it is available more generally, and join the millions demanding that politicians must act to prevent climate disaster. Not Stupid aims to turn 250 million viewers of "The Age of Stupid" into climate activists, all focussed on the UN Climate Summit in Copenhagen in December 2009, when the successor to the Kyoto Treaty will be finalised. Supported internationally by all the key climate NGOs, including Friends of the Earth, Greenpeace, WWF and Stop Climate Chaos, the campaign will utilise a range of cheeky postmodern tactics  including the already infamous "Stupid certificates" and the "Matchmaker" dating service which will introduce viewers to their best-fit activist group  to persuade people off their sofas and into action. As you may know Archant Norfolk is looking to shed 54 journalist jobs from its newsrooms - around a 1/3 of staff. I believe that this will seriously impact the coverage which the EDP and Evening News and the weekly papers such as the Lowestoft Journal will be able to provide. 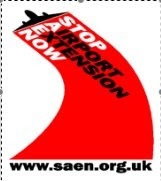 Southend meeting against airport expansion! Worried about what the extension at Southend Airport could mean for South East Essex? Want to hear about the alternatives for a sustainable transport policy that will enable people to travel in a way that does not endanger the well-being of others or the environment? Come to Southend Library on Thursday 26th March 2009 at 7:30 p.m! Going to another great Green Fair! No, not the economy… Spring is coming! Bulbs are sprouting and bushes are beginning to bud. The snowdrops are fading and daffodils are taking their place. Walking in the parks and fields, with the sun shining and birds singing, its difficult not to feel a sense of optimism, and the Hadleigh Green Fair next Saturday (14th) should be a great way to get outside and enjoy the new season. With the new surge of energy in the natural world I feel a new sense of urgency about the pressing problems we face. According to the new economics foundation we have used 7 of our 100 months to save the planet from catastrophic warming. . . The Hadleigh Green Fair promises to be one of the best Green Events of the season. Foot-tapping live music will be performed throughout the day, in the heavenly timbered medieval Guildhall, by the popular local band Sleeper Cell. Mediterranean gypsy folk music by Corner House Trio will float into the enchanting Mad Hatters Tea Garden where homemade cakes and Gemma's Spring broth are provided by Café Green. Blue Sky Pink are also there, giving you ambient jamming music with a kick. There will be an exciting range of craftwork stalls offering Fair-trade gifts, organic healthcare and skin products, hand-printed greeting cards, children's wear, decorative glassware, ceramics, and gifts and accessories hand-made from recycled and organic fabrics - and our very own Hadleigh Thrift Shop. Hillside Organic Farm Shop will be there, as will the Hadleigh Local Food Initiative, Elmsett Greenlife Grove Scheme and Orchard Barn Environmental Centre. Somewhere in the beautiful enclosed garden, you will find Richard King basket making and Richard Bates working his pole-lathe demonstrating green woodturning. At every turn, you will encounter exhibitors explaining how you can save energy, save money and save the planet. Ian Bowers of Aran Services with a solar water heating display; The Green Edge exhibition of micro-generation and solar water heating; the sustainable building materials store Earth and Reed; John Taylor with C Red (Carbon Reduction) and the Energy Saving Trust; other experts explain Master Composting and Recycling; and Ray Wand of Sustrans promotes cycling in and around Hadleigh. Come along and join the fun. Free admission – donations welcome. Hadleigh Green Fair Saturday 14 March 10am-4pm The Guildhall Hadleigh. This is fascinating and seems prescient. RR's 1 minute Green manifesto for the East of England - on TV! Goto http://tinyurl.com/c3vs8w ; 47 minutes in is my '1 minute manifesto' for Euro-09! Nicholas Stern has famous remarked that 'climate change is the greatest market failure the world has ever seen'. But this increasingly-popular dictum is quite mistaken. We need a new paradigm, if we are to save our common future. A judicious mix of strong government intervention and regulation, rationing (e.g. of carbon), and localisation, is the way forward - not the neoliberal nonsense peddled still by Stern and so many others. Without such a new green economics, the climate conundrum will certainly become a climate catastrophe. 'In Japan the government sent money created in this way to citizens, who are likely to spend it and stimulate the economy directly. Here the government buys the worthless assets of bankrupt financial institutions. Since UK plc is not in its entirety worth even a fraction of the debts that were incurred during the decade of asset bingeing this is a policy of despair that cannot work and will do nothing to help us avoid the looming Depression. 'The Green Party has had a policy of Citizens' Income for about 30 years. This would be an ideal way to put more money into the economy, especially since the poorest would benefit most and are the most likely to spend rather than saving. Money created by the public should be invested for the public good. Other alternatives would be spend the money on building hospitals, school and our rail network. Rupert and Peter in Shropshire Star! particular issue: this would be a good one to push him on in the future. time. Where do they propose to put the flights? him to re-think his mad plans for aviation in the east." 1. 2. 3. Rupert's Read: March 2009 4. 12. 15. 18. 19.